Pope party in the USA: The Wednesday Slatest. 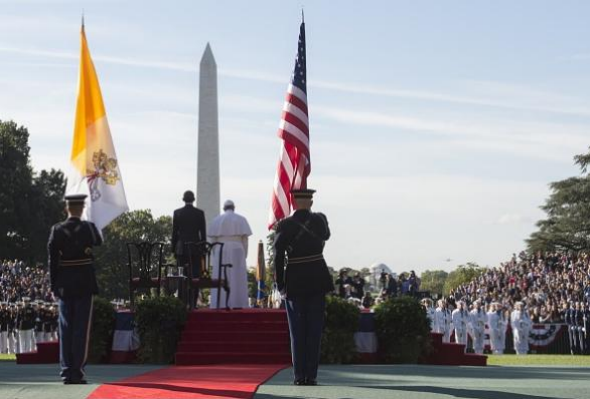 The Pope and President Obama outside the White House on Wednesday morning. Hello, Slatest readers! Here’s what’s going on in the streets on Wednesday. Then he took the popemobile for a quick jaunt down the National Mall, stopping to receive a gift from an adorable five-year-old. He also declined to answer a reporter’s question that sounded like it referred to “Negroes” but turned out to be about migrants. And later today he’ll canonize an 18th-century Spanish missionary, a move that’s created some confusion and controversy. Hillary Clinton says she’s against the Keystone pipeline. The FBI reportedly discovered some emails that were deleted from the private server Clinton kept as Secretary of State, which could be good news for her if she’s been telling the truth about her email habits. And beloved Hall of Fame catcher Yogi Berra died at the age of 90. Have a good day out there.